"It took the Dow Jones Industrial Average and the S&P 500 basically twenty five years (give or take a month) to recapture the nominal 1929 secular highs. 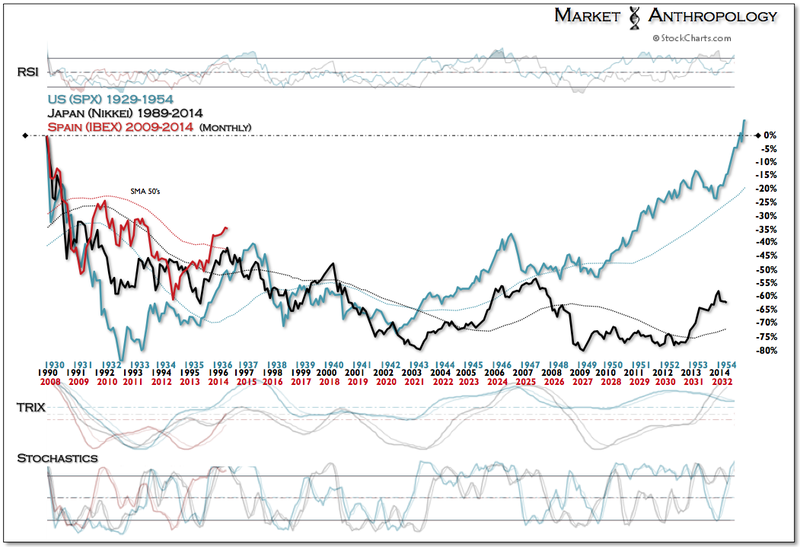 With Japan's Nikkei now trading well into its twenty fourth year since its secular peak in 1989, we thought we would take a quick comparative look at the two most cited deflationary spirals (as weighed by their respective equity market performances) and contrast them with the most recent European deflationary trend as expressed by Spain's IBEX index." Tuesday - 4/22 - Apples To Apples - Even When It's Not! "As Apple pulls into another earnings report after the bell Wednesday, we thought we would update our momentum comparative that has painted the inflections and trajectory on the tech behemoth quite closely over the past 16 months. While Apple's performance this year has not surprisingly consolidated the strong upside reversal witnessed in 2013, the momentum going into earnings is still presenting an upside bias for the stock." 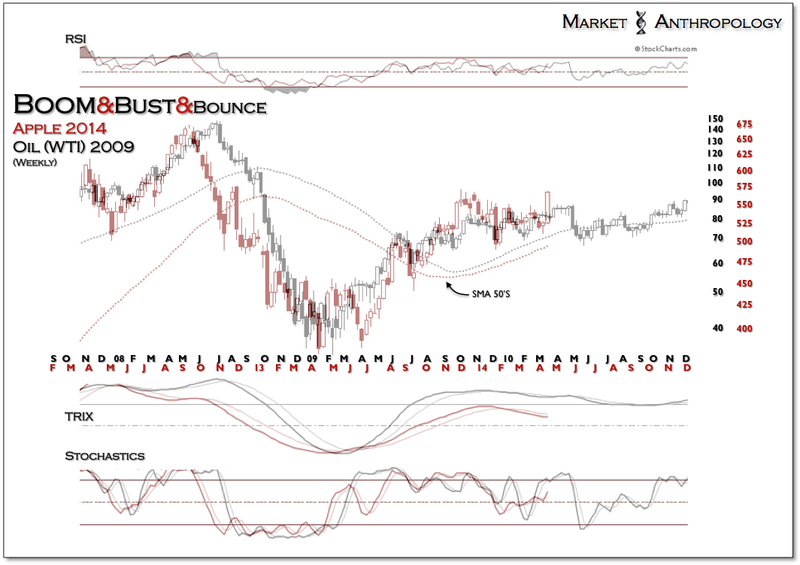 "Anecdotally, we are seeing and hearing from those anxiously long the precious metals sector and contentiously short. With gold and silver down sharply in the early morning session - then reversing violently higher, the emotional spectrum in the market is likely diverged at or near another extreme. Over the past 10 months, both bulls and bears alike have been waiting for the next leg to commence. 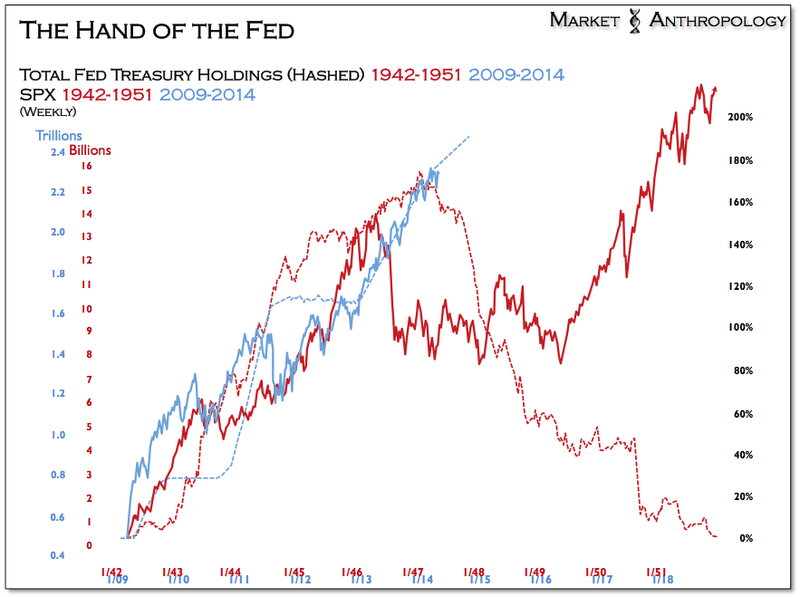 Instead, the market has played the jester - traversing a narrowing range and taking turns at frustrating both sides." "While we understand the reticence by some of looking for guidance at a monetary policy regime of yesteryear and near the birth of the Bretton Woods System, we see more parallels than differences when considering the Fed's quite visible hand and their policy disposition with respect to the broader interest rate cycle. 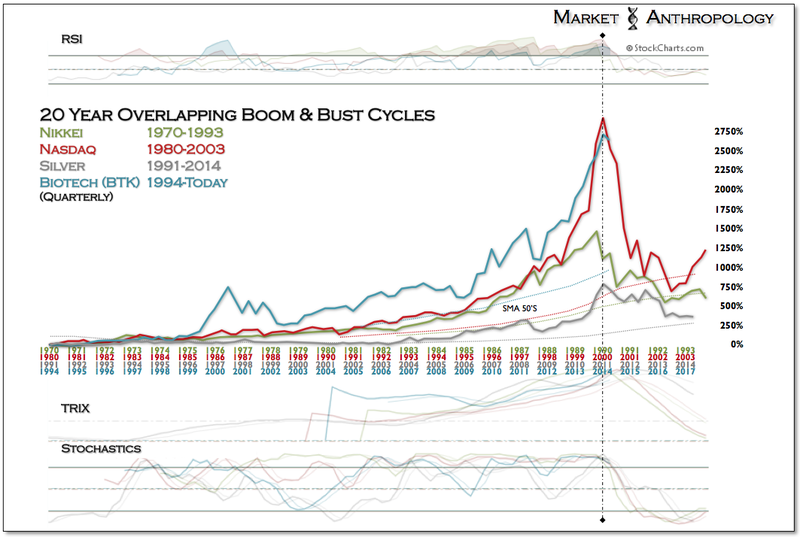 From our perspective, the current Fed cycle - because of ZIRP and QE - is nothing like the previous 15 tightening periods since the post-war period began."